If you're looking for some outdoor go karting in the South West then the Haynes Motor Museum circuit near Yeovil is worth a visit. The track itself is pretty big as it's also used for cars so there will be a variety of layouts throughout the year (400m, 460m and 640m lenghts) which, for the enthusiast means a return trip to learn ne 'lines'. 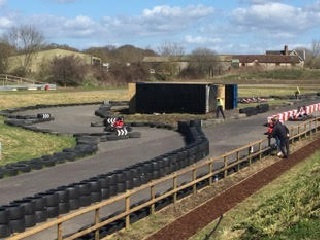 The venue is run by the same team that look after the indoor track at Cheddar so they know how to do things properly and the karts/equipment are well maintained. Most days the track will be running battery-powered karts but petrol-engine karts can be available subject to conditions. 6 practice laps, 5 heats of 4 laps, 5 lap quarter final for all drivers, 5 lap semi final for top 10 drivers then an 8 lap final for the top 5 drivers. 6 practice laps, 5 heats of 5 laps, 8 lap quarter final for all drivers, 10 lap semi final for top 10 drivers then an 12 lap final for the top 6 drivers.